David Chaves Diéguez obtained the M.Sc. degree in Telecommunication Engineering (major in Telematics) from the University of Vigo in 2007, and holds a Ph.D. in Information and Communications Technologies since 2016. 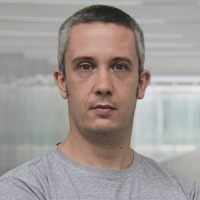 He is currently the head of the Intelligent Networked Systems area in GRADIANT, where he has previously worked as a research engineer, after cooperating for some time with the Information Technologies Group in Universidade de Vigo. His research expertise includes vehicular communications networks, delay/disruption tolerant networks (DTN), low power wireless sensor networks, e-health systems, ambient intelligence applications and nomadic information systems. He has also participated in many projects in this topics, often as PI, and has published several contributions to standing academic conferences and journals. More recently, he has been working in several projects applying the IoT paradigm to various solutions, and also developing technologies supporting that same paradigm and decision-support systems. This topics were also reflected in the main contributions of this Ph.D Thesis.